4-Word Review: Ruined by a lie. Martha and Karen (Shirley Maclaine, Audrey Hepburn) are two single young women running an all-girl’s school. They have the respect of the community and the parents, but that suddenly changes when one of the students named Mary (Karen Balkin) decides to spread a rumor that Martha and Karen are lovers. This sends everything into an uproar. All the students are moved out and the two women find themselves fighting desperately for their reputations and livelihoods. Karen’s boyfriend Joe (James Garner) remains their staunch supporter, but eventually even he begins to have his suspicions. The film is based on the landmark play written by Lillian Hellman which ran for 691 performances in 1934 and was based on a true incident that happened in Scotland in 1810. The original film version of the play was made in 1936 and entitled These Three that was also directed by William Wyler and starred Miriam Hopkins as Martha who in this film plays Martha’s Aunt Lily. That film was heavily watered down with the lesbian element completely taken out and instead has the rumor revolve around the two teachers being in love with the same man. This second film version was supposed to be more like the play, but hardly seems worth the effort. Although Wyler makes some attempts to make it seem more cinematic it still comes off very much like a filmed stage play and a static one at that. Lots and lots of talk with a narrative that is quite plodding and predictable. Having the story work more in a fragmented style might have helped, but either way it is never very engrossing or compelling. It also completely skips over the libel trial, which I thought could’ve given some added drama and it never completely explains why the Aunt Lily character avoided testifying. She comes up with the lame excuse that she was touring with her show, but I felt it was more because she secretly knew Martha was a closet lesbian and didn’t want to have to confront that and the film should’ve made this more clear. It is also unintentionally funny at times especially the part where actress Fay Bainter’s eyes get bigger and bigger as Mary whispers her ‘shocking’ secret into her ear. Balkin also overdoes the facial expressions, which was probably due to too much coaching on the part of Wyler, but with that said her presence in the film is fun and gives the proceedings a liveliness that is otherwise stagnant. The film really isn’t all that groundbreaking either and handles the delicate issue in too much of a timid way. For instance there is a scene where Martha admits to her homosexual feelings and states that she feels ‘ashamed’ for having them and Karen counsels her by stating that ‘you did nothing wrong’ because ‘nothing happened’, but what if it had then would it have been wrong? I tend to lean towards the latter making the production seem as stale and prejudicial as the public at the time. I was also confused as to how the two women could remain living at the school when all the students had moved out and they no longer had any income, or how they were still able to have groceries delivered to them. 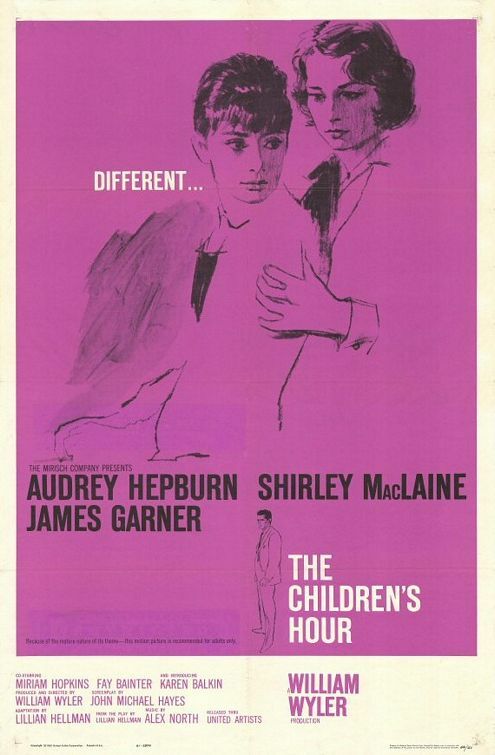 This entry was posted in 60's Movies, Black & White, Drama, Gay/Lesbian, Movies Based on Actual Events, Movies Based on Stageplays, Movies with a rural setting and tagged Audrey Hepburn, Entertainment, Fay Bainter, Karen Balkin, Movies, Review, Shirley MacLaine, William Wyler. Bookmark the permalink.